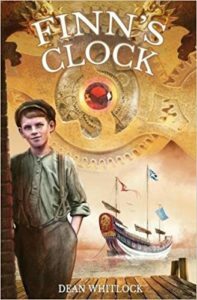 FINN’S CLOCK, A historical fantasy set in a time when steam is threatening sail, factories are displacing workers, and the immigrants are Irish – unwanted and under threat, but determined to make their place here. It’s 1853, and into Boston Harbor sails a sea-going Chinese junk, bearing magic, mysteries, and a firebrand named An-Ming. Find out more at www.deanwhitlock.com.